Schools closing, shops empty, full nursing homes. This is increasingly the state of affairs in developed countries around the world. Countries such as Italy, Spain, Japan and South Korea are the first to deal with plummeting birth rates and skyrocketing dependency ratios. Japan is undergoing one of the tightest demographic squeezes, and many in the developed world view Japan’s ageing crisis as a sign of changes to come in their own countries. As alarming as Japan’s demographic shift is for the Japanese economy and society, a similar greying in China could have potentially catastrophic worldwide consequences. Declining birth rates and swelling ranks of pensioners are already altering the weave of Japan’s social fabric. 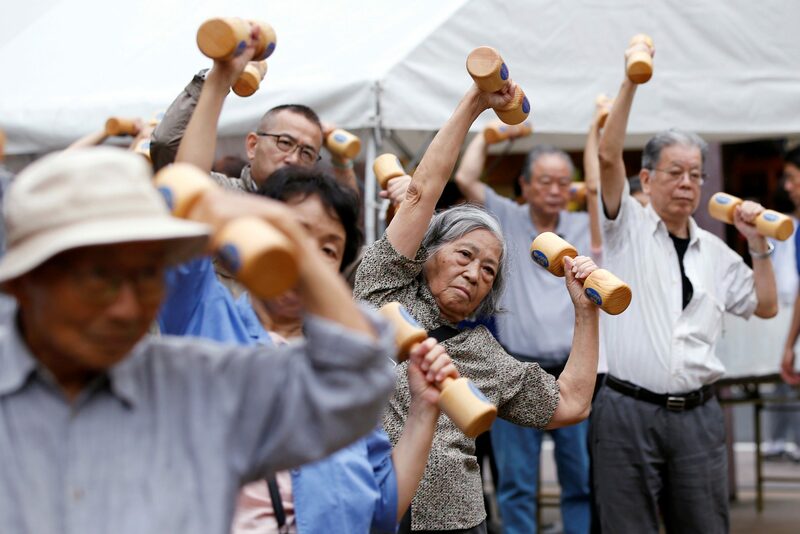 Japan’s surging elderly population will require more health care and nursing. Life will increasingly revolve around the elderly. Large numbers of workers will be required to provide adequate care, and community-oriented solutions will be critical. ‘Dementia Towns’ are changing public transportation and building design to be more friendly to the elderly, and patrols of designated helpers roam the streets helping lost dementia-sufferers. Elementary schools close for lack of students. Entire towns fall silent. As Japan’s society ages, its economy is set to slow down significantly. Fewer new workers enter the workforce every year, depriving businesses of much needed employees. Additionally, an increasing portion of the government’s budget must be dedicated to health care, reducing its ability to meet other challenges. But not all the changes brought by ageing are negative. Less young people and more job opportunities means there will be drastically less young unemployed people. This reduces social unrest and will likely calm Japanese politics considerably. Japan’s foreign policy will also likely mellow as its population ages. The developing world’s ageing crisis has been a slow burn and has not upset the global economy in a meaningful way. So far the effects have been muted. Besides Japan, the grey tidal wave has yet to hit any economies of global significance. The United States, Great Britain, and France have escaped the economic consequences so far due to their high levels of immigration. However, the next in line for a geriatric surge is China, and the global consequences could be severe. China’s infamous ‘One-Child Policy’ succeeded in slowing China’s explosive growth. But it has only hastened the coming of an ageing crisis similar to what is being seen in Japan. China will soon face the rising health care costs and worker shortages that has Japanese economists wringing their hands. Japan’s GDP is expected to be essentially static for the foreseeable future. The global market contracts at the sign of any economic slowdown in China; imagine the response to a full stop. China is ill-equipped to deal with these changes. In Rudong, the test-city for China’s ‘One Child Policy’, businesses struggle to find employees and the social services are strained. Moreover, China’s One Child Policy added another variable to the mix. A preference for male children has led to a huge gender imbalance with hundreds of thousands of young single men unlikely to get married for lack of available partners. These “Bare Branches” will likely be the cause of significant upheaval in Chinese society for years to come. Much of the world’s prosperity in the past thirty years has come off the back of cheap and reliable Chinese labor. As China’s workforce shrinks and labor costs rise the world will be forced to move their factories to other, possibly less stable, developing countries or accept higher manufacturing costs. This could result in any number of international crises; a broad economic slowdown, a renewed round of neo-colonialism, and strategic jockeying for new shipping arteries are all possible. While China’s demographic wave is a nigh unstoppable force its effects can certainly be mitigated significantly. China should look to Japan’s efforts in dealing with an ageing society for ideas and solutions. To address the shortage of workers, Japan has begun initiatives to increase the overall employment to population ratio by encouraging employment for the elderly and for women, two populations that could give Japan’s economy a much-needed boost to its workforce. Certain cities in China have taken this approach, and have started “schools for the elderly” where seniors can take classes and stave off loneliness. In terms of dealing with the social ramifications of ageing, Japan has taken a hard turn towards automation of its nursing homes. While Japan certainly has a unique affinity for robots, increased automation in geriatric care could reduce the strain on China’s nursing homes. China should also learn from Japan’s stubborn opposition to immigration. Increasing immigration into China could provide the workers needed to keep China’s economy humming. China’s grey wave will make powerful changes to its society, economy, and foreign policy. But it is not too late for a concerted policy response to mitigate the negative effects. For solutions, China, and indeed the entire developed world, should look to Japan, one of the first of many to tip over the demographic cliff.